Of course they do. Japan is famous for interesting Kit Kat flavors, and this latest one might be the most unusual one yet. Last year, for example, sake flavored Kit Kats were released in Japan. They were made with sake power and contained 0.8 percent alcohol. This has to be the most unusual Kit Kat flavor yet. Starting this week and available for a limited time, “nodo ame” (のど飴) or “cough drop” flavored Kit Kats are being released. According to My Navi News, the Kit Kats are contain 2.1 percent cough drop powder, giving these chocolate wafer snacks a refreshing flavor. 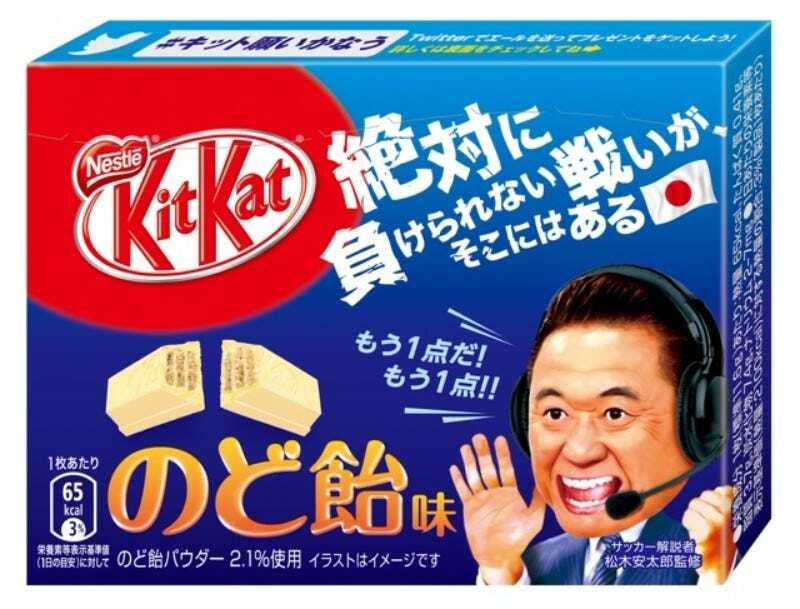 That’s soccer announcer Yasutaro Matsuki on the packaging, underscoring the notion that these are good for shouting fans during the FIFA World Cup Asian qualifiers.